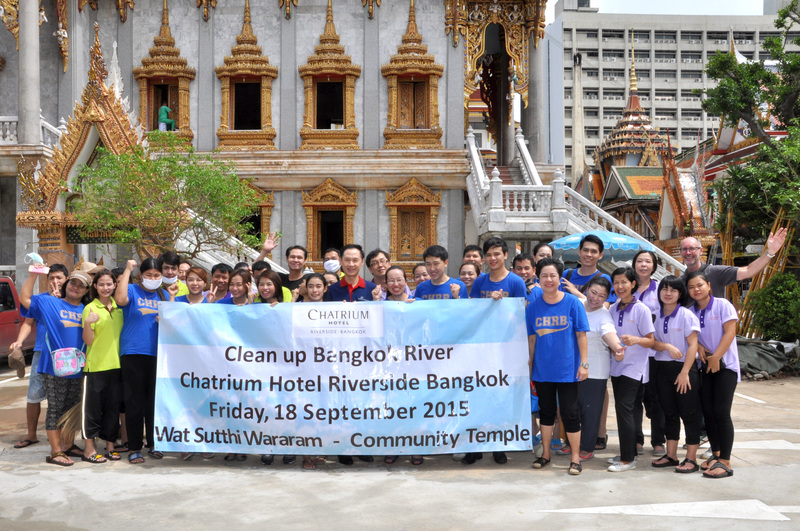 Bangkok, September 2015: Chatchawan Napawan (center), Resident Manager of Chatrium Hotel Riverside Bangkok led the management and colleagues to join campaign “Clean Up Bangkok River” at Wat Sutthi Wararam; a Community Temple. “Clean Up Bangkok River” is the project of “Clean Up the World” which is a community based environmental campaign that inspires and empowers communities from every corner of the globe to clean up, fix up and conserve their environment every year. This year, Chatrium Hotel Riverside Bangkok joined hands with seven partner riverside hotels and worked together to tidy streets, spruce up green space and remove rubbish from the canals that run into the Chaophraya River.